Whether you've just signed the lease on a new apartment or become the proud owner of your very own home, the next step in the moving-in process can be daunting: turning all those empty rooms into showroom-worthy tableaus of tasteful interior decor. Fortunately, arranging furniture can be easy—on the brain and on the muscles—if you follow some simple guidelines from the pros and steer clear of a few common rookie mistakes. Here are the best tips for putting a room together. 1. USE VIRTUAL TOOLS TO PLAN YOUR SPACE. Before you start shoving your furniture around—or pull the trigger on that huge, expensive sectional sofa that may or may not even fit in your living room—use an online tool like Pottery Barn's online room planner or Better Homes and Gardens's arranging tool to play with potential layouts. And if you need ideas for decorating a small or quirky space, Pinterest can be a great source of inspiration (if not outright copycatting). 2. KEEP AN OPEN LINE OF SIGHT. Visual space is important when it comes to furniture placement, since your eyes will wander around a room even when you're sitting still. Susie Novak, of West Coast-based interior design firm Susie Novak Interiors, says that first-time decorators often ask themselves whether a piece can physically fit, but stop short of questioning whether it jives with the character of the space. "Scale is a big one. I’ve often seen big sectionals in small rooms and small sofas in large rooms. The scale of the piece should suit the space," she explains. If your room has a focal point—like the living room fireplace, for instance—you'll want to keep the sight lines open between it and the entrance, so it's one of the first things you see when you walk in. And don't forget to consider how your space will look when glimpsed from another room; something like the back of a sofa can read like a big, bulky blockade if it's all you see when you look through the doorway. The view into a room should be attractive, or at least unobstructed, to make the space inviting. 3. IF IT DOESN'T FIT, NOBODY SITS. It probably goes without saying, but you don't want your decor to physically get in your way. Properly placed furniture should allow you to easily navigate your space without having to dodge, weave, or do parkour. Your "traffic lanes", i.e. the paths you use when walking around or through a room, should be roughly the same width as your doorways (usually two-and-a-half to three feet), so aim to leave at least this much space anywhere that you have two pieces of furniture you plan to be walking between. And of course, don't forget that anything you intend to put into a room has to fit through the door first; if you have exceptionally narrow doorways and not much room to maneuver, you may need to rethink your commitment to the overstuffed leather executive suite look. 5. KEEP CONVERSATION SPOTS COZY. For those of us without a lot of square footage, the idea of dividing a small room into two (or more) even smaller spaces might seem like madness, and arranging all the furniture around the perimeter of the room does make it seem bigger. But while a more spacious look can be appealing, it can also create functional issues: More than ten feet of distance between you and your conversation partner(s) means you'll all have to shout to be heard. Even if you don't have a huge living room, dividing the space into a couple different "zones," each with its own cluster of seating, will make the space feel more intimate and homey. Plus, you may find that a single room suddenly becomes twice as useful. 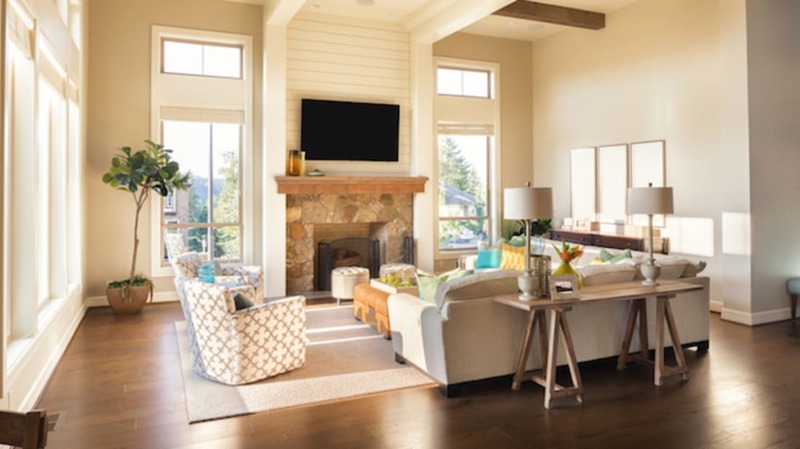 Says Novak, "A living room doesn’t need to be all sofa and TV; If there is empty space behind the sofa and/or the sofa is far from the TV, rearrange and add an office nook, reading chair and lamp, or kid play zone." 6. KNOW THE RULES OF THE RUG. In the immortal words of Jeffrey "The Dude" Lebowski, the right rug can really tie a room together. And Novak agrees: "The rug anchors and defines the space." Conversely, wrong-sized and/or poorly-placed rugs can throw off the balance of an otherwise perfectly put-together arrangement. The most common mistake? Says Novak, "People often go with a rug that is too small for the room." It's not hard to understand why, since larger rugs tend to cost more money. But while some of the rules of rug placement can be bent to fit a budget, you should be wary of torpedoing the look of your space by putting down a four-by-six in a room that really needs an eight-by-ten. 7. AND FINALLY, KNOW WHEN TO SAY GOODBYE. Whether you've downsized to less square footage or taken up residence in an oddly-shaped space, you sometimes have to just admit that your overstuffed chair, extra-long sofa, or huge heirloom china hutch from Grandma isn't going to fit. "Don’t hesitate to let something go if it doesn’t suit the room or if the scale is off; even if you got a great deal on it, love the look, or inherited the piece," says Novak. "If it blocks an entry or path of travel or you can’t move fluidly around it, it’s not working." Of course, if you know you'll be upgrading someday soon to a larger place, it might be worth it to live with a slightly-cramped furniture configuration for the sake of hanging on to your Forever Couch. (And you can always put a valuable or beloved piece into a storage unit, or your parents' basement if they're willing.) Just remember, once you've found a place you intend to stay in, that it's much easier to fit new furniture into an existing space than to trip over your old stuff every time you cross a room.